I had the great pleasure to visit Sopron in Hungary last week. This delightful city, much of the medieval heart of which is preserved beautifully, was at the heart of the Austro-Hungarian empire, but because of its proximity to Vienna, was never damaged by the Ottomans. In 1921 (as Ödenburg) the city elected to become part of Hungary rather than of Austria, with many ramifications for the Communist era that was to follow. It is a jigsaw-shaped peninsula of Hungary surrounded on three sides by Austria, and has the peculiar claim to fame that some of the world's best dentistry is here. Even the hotel I stayed in has an in-house dental clinic. I get the feeling that going to the dentist in Vienna might be quite a difficult thing - all the Viennese-in-pain seem to head for the border. Sopron also has a long and illustrious wine history. Once upon a time, one of the most highly regarded wine regions in Europe was called 'Sopron-Rust-Breslau'. Today, this region actually spans three countries: Hungary, Austria and Slovakia (Breslau being the German name for Bratislava). The majority of Sopron's vineyards are on the southern shores of Lake Neusiedlersee, a terroir exactly the same as the best of Burgenland in Rust. 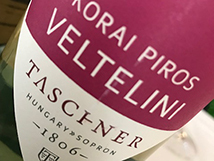 The main difference being that on the Hungarian side the wines are almost always dry, whereas sweet wines (both botrytis and late-harvest) are commonplace and highly regarded in Rust. There are also premium Sopron vineyards higher up in the range of hills to the south of the city. I visited and tasted with the charming Kurt Taschner. Kurt's English is far better than he thinks it is, and my German is fast nicht vorhanden, so we had the services of his friend Andras Somfalvi as translator. 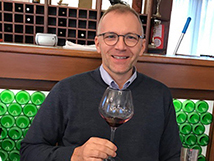 Andras is a winelover who has studied at the Weinakademie in Rust where I am teaching this week. The area was settled by Bavarians and Croatians post Roman empire. Prior to WW1, it was over 50% German. There remain entirely Croatian-speaking villages over the border in Austria. The legacy of this is that most of the vineyard names are German. The Germans were expelled after second world war, leaving a gap in winemaking knowledge (amongst other things). The vineyards began to be revitalised in early 1990s when lands were given back. Nevertheless Sopron was probably producing some of the best of the eastern bloc wines during the 1950s to 1980s, but they remained well hidden and difficult to find. Possibly because of their restorative effect following dental surgery..! 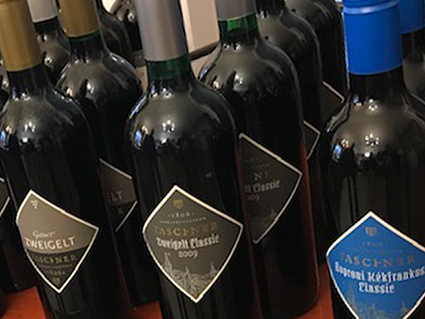 The Taschner family have been winemakers since 1806. 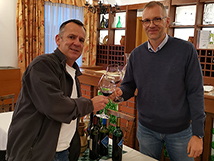 During the communist era where land was taken by the state, each individual was allowed to farm up to 0.3ha of their own land (per person in the family) and Kurt's father, Istvan, planted his to vines, while working as a winemaker at the co-operative. Today, Taschner has 30ha of land, with 20ha planted (almost everything has been replanted since the fall of the iron curtain). 8 people work in the small but perfectly equipped winery built in 2004. This is now surrounded by gleaming new housing units, where once it stood in vineyards ('wine gardens') - a legacy of the growth of this vibrant small city. The wine is mainly sold domestically, with 15% sold at the cellar door itself. But they do export a little - some even to Bordeaux, which is quite an achievement for a small winery from this corner of Hungary. 60% is black grapes producing mainly red, and some rosé wine. 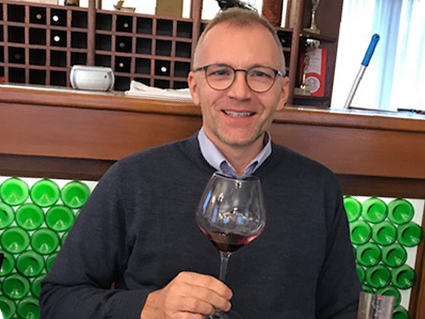 Kurt has the usual local varieties of Kekfrankos (Blaufrankisch), Cabernets Sauvignon and Franc, Merlot, Zweigelt, Pinot Noir and the only plantings in Hungary of Pinot Meunier (mainly for the production of traditional method sparkling), but some is also vinified as a red wine. Kurt makes sparkling wine in combination with Austria's Szigeti. The whites are a little more eclectic. Irsai Oliver and Malvasia are locally well known, along with the more specific Gruner Veltliner, and international Chardonnay. 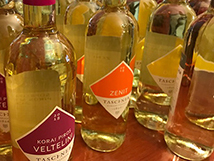 Some local specialities include Zenit (one of a range of crosses made in the 1950s beginning with 'Z, this one from Ezerjo x Bouvier) and Korai Piros Veltelini or Early Red Veltliner. (Red Veltiner x Sylvaner). Historically the winegrowers of Sopron were called “Ponzinchter” by their German-speaking counterparts. This colloquial term means “Bean Farmers” and was derogatory - due to the poor farmers needing to maximise their land by planting things to eat between the rows. How ironic, now, that the world's trendiest vineyards are planting beans between the rows, and the plants reinvigorate the soil by putting back nitrogen and other minerals - prized for organic viticulture So, ponzinchter could be regarded as far-sighted and a compliment these days. Kurt's wines are all very well priced and attractively packaged, almost all with screw-cap. This grape loses acidity quickly and the wine therefore should be drunk young. (Ezerjo x Bouvier) Ezerjo means ‘thousand good’ (suitable for late harvest, and some sweet wines are made from it). ‘Blaufrankisch as a variety was registered in 1875 in Colmar, Alsace (as 'Great Burgund'). However, the origin of the name has a local Sopron story. When Napoleon invaded, his soldiers were entitled to a ration of local wine. They paid for it with their French-army-issued 'White Francs'. This currency was pretty much worthless outside the army, and so it rankled the locals and accordingly the wine they supplied was not great. The existing local currency was the gold-backed 'Blue Franc' Soldiers wanting good wine therefore had to pay in ‘blue francs’. Hence 'Kekfrankos' ('Kek' is the Hungarian for blue). However, at that time there probably wasn’t any red wine in Sopron, so this charming story is probably nothing more than myth. But never let the truth get in the way of a good story!. First recorded use of Kekfrankos was 1893 post-phylloxera. Lemberger (another synonym) in South Styria is probably the original name and where the crossing was first made. Although no-one knows how the 'Frankos/Frankisch' part of the name arrived - the grape has never been grown in France. Single vineyard. Planted 1967 by Istvan Taschner when working at the co-operative. Richer, spicier, oakier aromas. Some stewed fruit. More serious tannic structure. Rich spicy fruit. 15.5.